Episode: 16 Site Numbers: 008, 011, 042, 060, 124, 337, 534. Date Posted: 26 July 1996. Update 8 March 2000. Location: Various. Type: Artifacts. "The Knights of Chivalry used flags (called standards) with the Cross of St. George always at the hoist. This was to denote that, whatever family the bearer may belong to, he is first and foremost an Englishman. The fly is divided per fess (horizontally) with the colours of the arms, the edge fringed or bordered of the colours of the arms alternating over all the crest or principal charge. Swallow tailed. Extreme length 3ft 2-1/2in, from head to split of swallow tailed 2ft 2in. Cross of St. George 12 inches square, width of cross 1-3/4. At my suggestion the officers of the 1875 Arctic Expedition adopted this form for their sledge flags, and I designed their flags. Also at my suggestion the officers of the Antarctic Expedition continued the tradition, adopting the same form for their sledge flags, which I designed." It's obvious a lot of time and creative energy was spent in designing and making these accoutrement to dog-, pony- and man-hauled sledges. Although they may have had a certain utility in the sense of identifying sledges and making them more visible from a distance, that they were made and used at all may have more to do with the whole 'Boy's Own' approach to things that seemed to permeate British exploration during the Imperial era. In his Discovery diary Wilson notes that "we didn't go to church, but worked, I at my seal paper, Ory at the flag. "(28 July 1901--95 years ago today!) So perhaps spouses, mothers, sisters and sweethearts were the creators. Wilson later relates that "On each of the three sledging excursions I have been on so far I have flown my flag, but the Captain [Scott] has taken a dislike to his and says there will be no flags on the long southern journey." (19 Sept 1902). Scott must have relented because when the polar party--Shackleton, Scott & Wilson--departed on 2 November 1902, they "were photographed with their 19 dogs, five sledges and our flags." Vol I of the South Polar Times includes color plates of the flag designs. 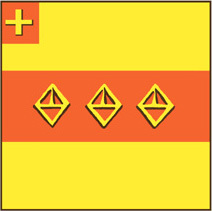 All but Shackleton's are long rectangles with two tails, a St George's Cross closest to the flagstaff followed by individual designs that include family crests. Shackleton's is unaccountably square in shape with no tails. Some of these flags are on display or in collections and surely some are still proud family possessions. 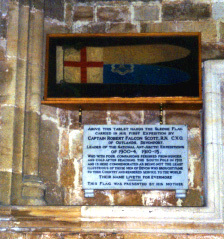 Scott's flag (011) is in Exeter Cathedral, mounted on the rear right side of the cathedral near the entrance. A stone plaque below reads: "Above this tablet hangs the sledge flag carried in his first expedition by Captain Robert Falcon Scott, R.N., C.V.O. of Outlands, Devonport. Leader of the National Ant-Arctic Expeditions of 1900-4 and 1910-13. Who with four companions perished from hunger and cold after reaching the South Pole in 1912 and is here commemorated as being not the least illustrious of those men of Devon who brought fame to their country and rendered service to the world. Their name liveth for evermore. This flag was presented by his mother." Scott's mother made the flag "according to a design of Sir Clements Markham, Scott's mentor. 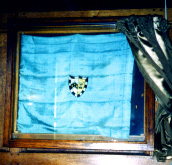 Wilson's flag hangs in Gloucester Cathedral (124). I thought it was at his Cambridge college, Gonville & Caius, but going there last October and seeing the flag in the dining hall, it was clear that this was the college flag which Wilson took south with him (042) and not his sledging flag. It's mounted on the wall beside the high table, protected by a covering. During that same visit to Cambridge I came upon a postcard at Scott Polar Research Institute of Gloucester Cathedral with the notation that Wilson's sledging flag hangs in the Lady Chapel. Well, during a visit in January 1998 I looked in vain for the flag and asked a volunteer Cathedral guide about it. I was told that nothing like that was in the Cathedral and, to his knowledge, never had been! Shackleton's sledge flag (008) hangs in a case in the museum at Scott Polar Research Institute in Cambridge (along with a bronze bust and the wooden box for submissions to the South Polar Times). Although there might well have been other reasons for it's unorthodox square-shape, it certainly stood out from its swallow-tailed counterparts and at a glance told that Shackleton was there. It would be interesting to learn of more flags still extant and whether or not this tradition was strictly British. Update 8 March 2000. Susan Sawtelle emailed on 18 April 1999 to mention that James Wordie's sledge flag (534) was included in the Shackleton show at the American Museum of Natural History. It was made by his sister and includes the Latin phrase Nil Indigne--Nothing Unworthy. In January 1939 Lady Maxwell, sister of 'Birdie' Bowers, donated to the school's Hall of Memories the pennant she had embroidered for her brother's sledge. This pennant has an interesting history. Individual sledge pennants had been made for Scott's first Antarctic expedition, and the custom continued on the 1910-12 expedition. Lt Henry Robertson Bowers was originally in charge of stores on the Terra Nova. His abilities, however, impressed Scott so much that by the time the vessel had reached Melbourne he was included in the shore party, and Bowers delightedly wrote home saying he would now need a sledging flag, including specifications and a sketch. It did not reach the Antarctic, however, until the Terra Nova returned there in January 1912. By then the polar party had already left. The pennant, 920 x 310mm, recently cleaned and framed to ensure its long-term survival, was expertly made in silk fabrics, with hand-stitched seams and finely-worked silk embroidery. It carries the red cross of St George, on a white ground, common to all the sledge pennants, and also, on a blue ground, the Bowers family crest--a leg pierced by an arrow, encircled by a belt, with the motto Esse Quam Videri ('To be, rather than to be seen'). Sledge flags have been in the news recently. Two were featured in Christie's Exploration & Travel sale on 17 September 1999: The first was the flag Scott flew at the South Pole. It was thankfully withdrawn from the sale and purchased "for the nation." It is now at the National Maritime Museum at Greenwich. The second flag, lot 204, was also Scott's and possibly with him at the Pole. [Along with the one at Exeter Cathedral, this makes three Scott sledge flags. Are there perhaps more out there?] With the buyer's premium, the flag went for �34,500.